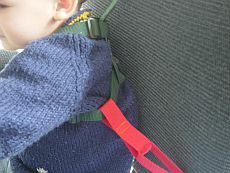 Chair strap to use with Child Harness, Toddler Harness, Special Needs Safety Harness, Child-to-Adult Safety Harness. You can use a chair strap with the Baby Harness or Special Needs Safety Harness to keep your child seated in virtually any style of chair. 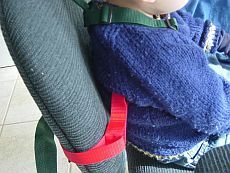 Parents of young children will order a chair strap to use with the Baby Harness when going out for meals in restaurants. Parents of children with autism will order a chair strap to keep their child secured at their work table or dinner table. black, navy blue, pacific blue, red, purple and pink. We have discontinued the army green in the picture. Some customers have ordered two chair straps in different colours for use with different chairs in their home and community. Having multiple straps avoided the need for constantly adjusting one strap to fit different chairs. 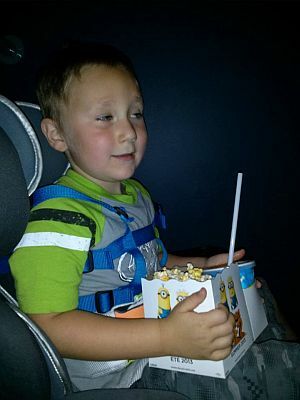 Here is a picture of the chair strap being used with a pacific blue Special Needs Safety Harness on a little 5 yr old at the movie theatre. 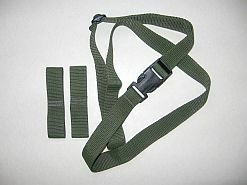 The loops are on the chest strap of the harness and the chair strap is around the back of the movie theatre seat. 1. 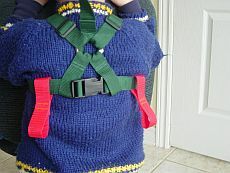 Slide the loops onto the chest strap of the harness and seat your child in their chair. 2. Put the chair strap through one loop on one side of the harness. 3. 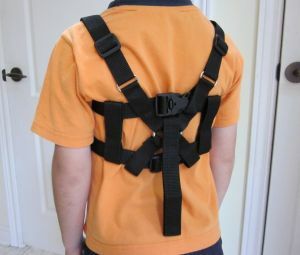 Feed the chair strap around the back of the chair and through the loop on the other side of the harness. 4. 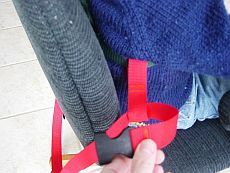 Join the 2 ends of the chair strap at the back of the chair and do up the buckle. 5. 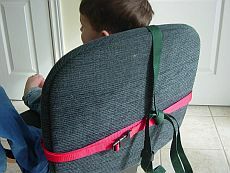 Adjust the chair strap to give your child the proper amount of freedom. 6. To limit their forward movement (i.e. 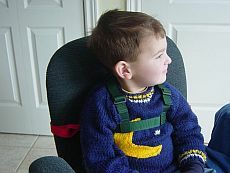 when the child is prone to drop seizures), tie the lead to the chair strap.